Campaigners are urging the government to re-think plans to teach pre-school children in England to read and write. A distinguished lobby of academics claims formal lessons could "harm" children at such a young age. They also believe an overly academic curriculum imposed on children below the age of compulsory education throws up civil rights implications. The government says the new model has been developed in consultation with early years education experts. The early years foundation stage (EYFS) becomes a legal requirement next autumn. It sets out a framework for what children are expected to do at different ages. This includes teaching toddlers aged three and four to write simple sentences, interpret phonic methods to read complex words and use mathematical ideas to solve practical problems. 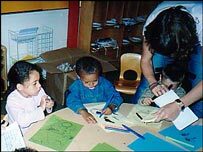 But it has provoked a revolt in academic circles with the formation of the Open Eye campaign, to alert the government to what they believe are the shortcomings of this formal approach to pre-school learning. In a letter to the Times Educational Supplement, they say: "Young children learn most naturally and effectively through a subtle balance of free play, movement, rhythm, repetition and imitation. "An overly formal, academic and/or cognitively biased curriculum, however carefully camouflaged, distorts the learning experience; and an early head start in literacy is now known to precipitate unforeseen difficulties later on, sometimes including unpredictable emotional and behavioural problems." The letter's signatories include the author of Toxic Childhood, Sue Palmer, childcare expert Penelope Leach, former London schools commissioner Tim Brighouse, psychologist Dorothy Rowe and author and child psychologist Richard House. Dr House told the BBC News website: "It's just not appropriate to manage everything - this audit mentality is coming into the early years stage and it is going to be disastrous. "If the practitioners have to look over their shoulder to tick boxes and are monitoring children, the quality of relating with children could be severely compromised. Supposing Einstein had been subjected to a system of synthetic phonics, what would have happened to the theory of relativity? "Child development is enormously diverse and some children learn to read and write at three while others, including Nobel-prize winners like Einstein, don't learn to read or write until they are 11 or 12. "Supposing Einstein had been subjected to a system of synthetic phonics, what would have happened to the theory of relativity? "If you are trying to get children to read and write so young, many of them are going to fail because they're just not going to be able to do it. "These children will be labelled as failures which could damage their self-esteem." The new curriculum is compulsory and will affect all nurseries and kindergartens in England - state, private and voluntary. Campaigners say the severity of the compulsory measures has gone largely unnoticed leading to accusations that it is being introduced by stealth. They say: "To impose a compulsory legal framework on what are pre-compulsory school-age children may well have profound civil rights implications." The system requires children to be continually assessed according to 13 different learning scales including writing, problem-solving and numeracy. A Department for Children, Schools and Families spokesman said: "The Early Years Foundation Stage is not a stealth curriculum. "This is a play-based approach to learning, development and care for young children which has been developed with thought, consultation and wholehearted backing of early years specialists. To suggest otherwise is scare-mongering." Campaigners want the government to carry out an "urgent, independent review" of EYFS, allowing diverse conceptions of child development to flourish without undue compromise. They want the status of EYFS reduced to professional guidelines, free of legal compulsion.